Tired of paying too much for printer ink? How would you like to save up to 80% on your printer cartridges and have them delivered to your door the very next day? 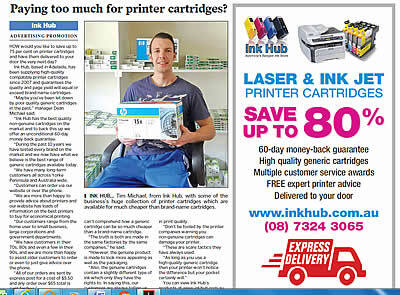 Ink Hub in Adelaide has been supplying high quality Compatible printer cartridges since 2007 and we guarantee that the quality and page yield will equal or exceed the brand name cartridges. Maybe you’ve been let down by poor quality generic cartridges in the past. Ink Hub has the best quality non genuine cartridges on the market and to back this up we offer an unconditional 60 Day Money Back Guarantee. Over the past 10 years we have tested every brand on the market and we now have what we believe is the best range of generic cartridges available today. We have many long term customers all over Yorke Peninsula and Australia wide. Customers can order via our website or over the phone. We are more than happy to provide advice on printers and our website has loads of imformation on the best printers to buy for ecenomical printing. Our customers range from the home user to small business, large corporations and government departments. We have customers in their 70’s, 80’s and even a few in their 90’s and we are more than happy to assist older customers to order or even to just give advice over the phone. All of our orders are sent by Express Post for a cost of $5-50 and any order over $65-00 in total is sent for FREE. Most people still cant comprehend as to how a generic cartridge can be so much cheaper than a brand name cartridge. The truth is that both are made in the same factories by the same companies however the genuine product is made to look more appealing as well as the packaging. Also the genuine cartridges contain a slightly different type of ink which only they have the rights to. So that's it folks, our story and a picture of my son "Tim" who is our main man in packaging and processing. Let us know how we could improve on our advert or maybe other places where we could further promote our wonderful Generic cartridges. Dont forget that if you need advice on inkjet printers or which printers are the cheapset to run then call Ink Hub and we will be more than happy to assist.